Traditional dentures have other shortcomings as well. For example, in many cases they promote bone resorption, a condition in which the patient experiences undesirable changes to his or her facial profile. You may have seen persons who are dealing with this problem; it can make their face appear to shrink or sink into itself. A freer, more active lifestyle: this includes eating a nutritious, well-rounded diet, participating in social and recreational activities, conversing freely with friends and loved ones, and living a more fulfilling life in general. Freedom from bone resorption problems: dental implants give the underlying jawbone the regular stimulation it needs to stay strong and healthy. The advantages for the patient are both practical and aesthetically pleasing. Ease of care: dental implants require only basic care. Your dentist will probably recommend using a non-abrasive brand of toothpaste to avoid scratching the restoration. If you opt for an implant-supported denture, then it’s a good idea to remove the product for daily cleaning. Dental implants are not the best solution for everyone. 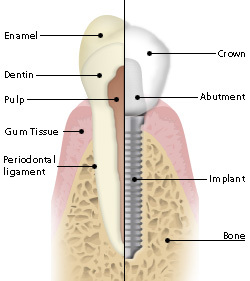 Only your dentist in Framingham can prescribe a specific course of treatment. Make an appointment to talk to him or her soon. You’ll soon be smiling at the results. Dr. Jean-Marie Biebuyk has performed over 1000 dental implant procedures during his career. His extensive experience and in-depth knowledge make him one of our area’s premier dental professionals. You can reach his office online or by calling (508) 875-0900.